More than just the workhorse of the kitchen, countertops complete the design and style of your kitchen. They must be beautiful, functional and durable! Currently the most popular choice in kitchen countertops, homeowners choose quartz surfacing because of its many advantages. Quartz doesn’t need to be sealed, and its seams blend very well. It is easy to clean and is heat, scratch and stain resistant. Because of its manufacturing process (binding quartz crystals with a resin-based product), quartz is durable and has a seemingly endless choice of colors and patterns available through brands such as Cambria, Silestone and many others. Granite surfaces are slabs of stone cut from the earth, making each piece unique. It is more porous than quartz and does require a bit more maintenance. You can order granite countertops with a polished, shiny finish; a honed, matte finish; or a specialty finish such as flamed or leather. Because of the many choices in colors and finishes, design flexibility is a significant advantage in choosing granite. This natural stone countertop is available in 2 cm (3/4”) and 3 cm (1-1/4”) thick slabs at a stone selection warehouse. 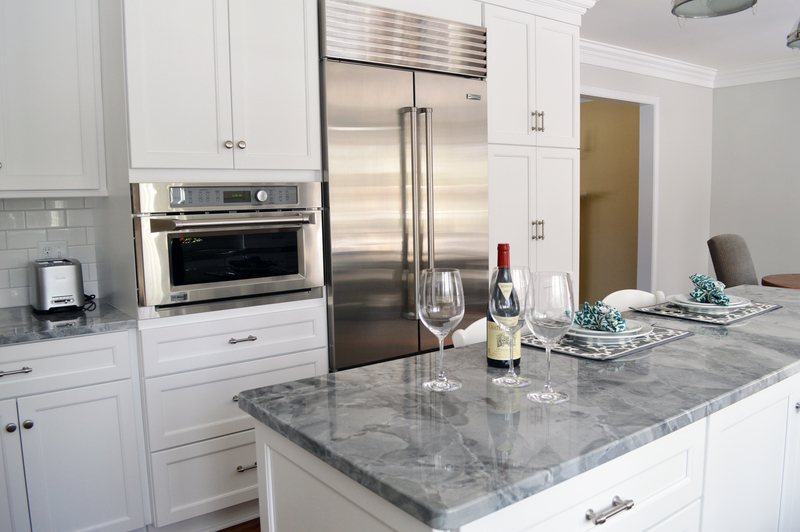 As a counter surface, marble offers a beautiful, timeless look. It has been a preferred stone in architecture throughout the ages. However we must warn you: marble is softer and more porous than granite. It is susceptible to stains and scratches. You might say it is more of a “living” finish, but be sure you are willing to “live” with it. Even so, some of the most beautiful countertop installations are in marble. Those who love marble should also consider quartzite because it is a natural stone with similar beauty. Quartzite is a solid, crystalline mass of mineral stone cut from the earth in slabs. It’s harder than most knife blades and is more resistant to etching than marble. The generally lighter, more subtle tones of quartzite give it design versatility. Would you be surprised to hear that porcelains are on the rise? It is becoming a popular trend for kitchen countertops! Although not completely new, porcelain slab countertops have improved greatly. Porcelain is beautiful, durable, and low maintenance. In contrast to solid surface and engineered stone counters, porcelains are rated for exterior use. A durable surface for hard-working kitchens, wood countertops are more sanitary than you may think! Wood offers warmth both visually (the color) and tangibly (in contrast to cold stone surfaces). Often we’ve designed a portion of a client’s kitchen countertops to be a wood species such as cherry, maple, hickory, walnut, teak, sapele or mahogany. If you use a wood countertop as a cutting or chopping surface, be willing to accept cuts and scratches in the surface and simply apply a food- safe oil to the wood. While we haven’t discussed all the surfacing options that exist, these six countertop options are trending in kitchen design. The lasting beauty and durability make these countertops the most popular choices. There are other good quality surfaces you may want to consider researching as well, such as Durango, Soapstone, semi-precious stone and concrete. “We love that it’s timeless” is common to hear when remodeling a kitchen or bath. 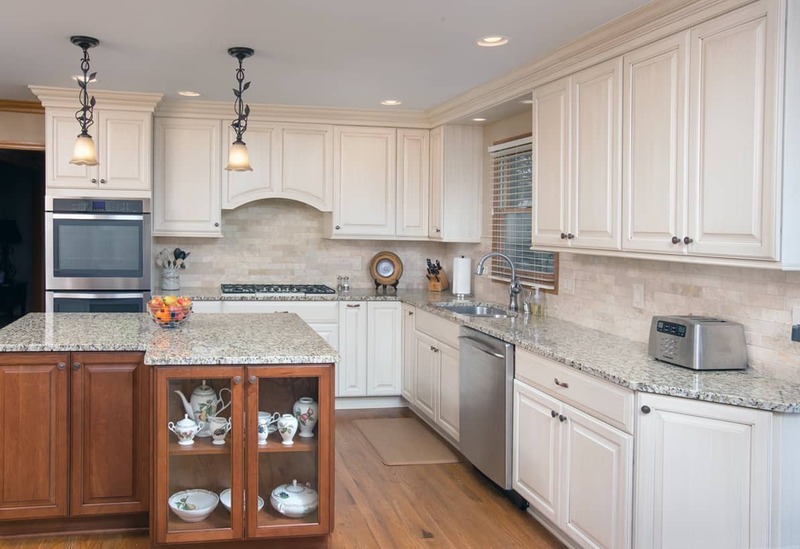 Many Ohio homeowners are asking for a timeless kitchen design. And while “classic” and “timeless” are in style, what can we say will never go out of style? 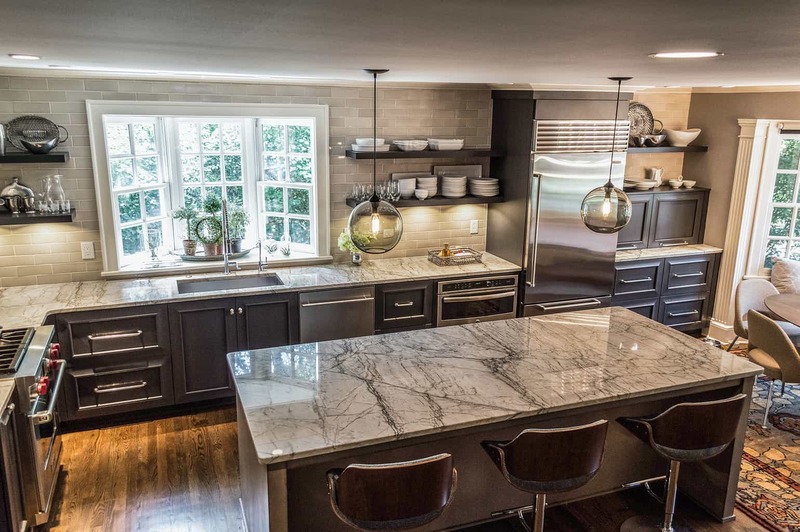 In this blog post, we’ll highlight five timeless kitchen design trends. 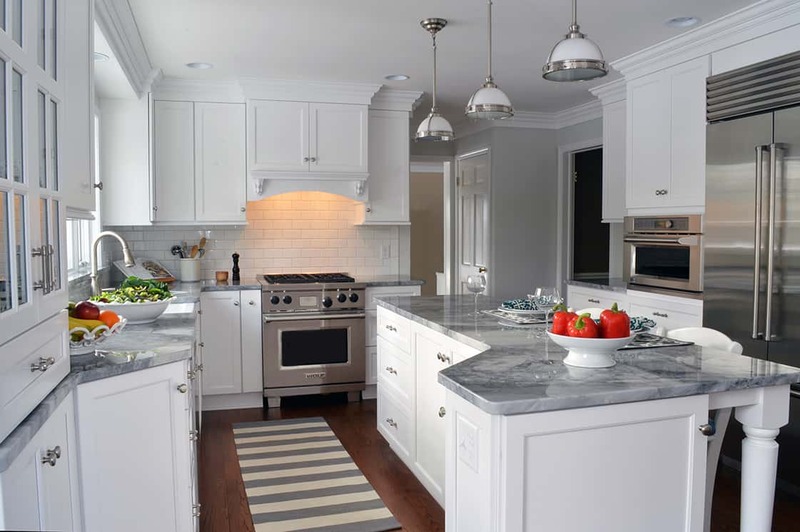 White kitchen cabinets are a well-established tradition dating back to New England and the Cape. 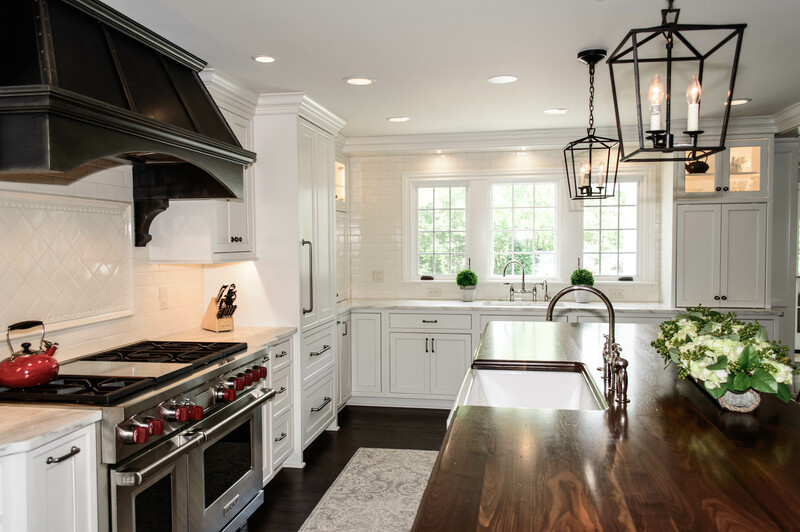 Today, white cabinets are no longer just found in cottages along the coast but are implemented in traditional or contemporary design across the U.S. What makes them timeless is the 100+ years they’ve remained in style. Shaker (or similar flat-paneled) cabinet doors are easily traced back to the Shaker communities of the early 1800s. In principle, Shaker design was guided by simplicity and utility; it was minimalistic, but ingenious. With stile-and-rail cabinet doors and dovetail drawers, we continue to see their influence on design even today. The historical foundation gives us reason to think this cabinet door style may never go out of style. When we talk about mixing furniture styles, we mean pieces that look like furniture—even freestanding furniture—that are incorporated into kitchen design. It’s timeless to have an unfitted look. Hoosier cabinets, pie safes, work tables, wash basins and other functional pieces were introduced years ago and are now buffet pieces and islands. It’s not cobbled together as it was historically, but now we design these mixed furniture styles to look evolved. Marble is both ancient and truly trendy right now. Buildings still standing from ancient Greece and Rome have marble interior surfaces, exteriors, sculptures and art. The material itself has withstood the test of time. Today, is marble popular? You bet. Marble countertops are on trend. Trying to ride on the popularity of marble, many quartz and granite manufacturers—even laminate manufacturers—are trying to duplicate the look of marble. Hardwood flooring is a true classic. We can prove it. Many Colonial-era homes featured old-growth hardwood floors. And later around the late 1800’s, polished hardwood floors became mainstream in America (source: OldHouseOnline). Consider the basics in a kitchen: cabinetry, countertops, flooring, and fixtures. If you are seeking to create a look that can better withstand the test of time, look for those foundations within historical design that speak to timelessness. Be creative within those foundations and the end result will be simple but artistic; both timeless and current. Children’s bathrooms are absolutely fun to design! We focus on the details when we are designing a bathroom, and the kids’ bath is no exception. Function: While it is fun and fulfilling to create the ultimate bath for the “little one,” design the functional aspects (such as the tub) not just for a small child, but also for the child as he or she grows. Themes: Fun themes are great, but avoid purchasing permanent themed fixtures. Instead, introduce a theme using towels, floor mats, wall stickers, toilet seats and wall paint color. Features: Some features that both a child and an older teen would appreciate are ample ledges or shelves in tubs/showers as well as soft-close cabinet doors, drawers, and toilet seats. Also consider conveniently placed small storage compartments for products used daily. How do you design a bath your kids won’t outgrow? Our top four considerations for a well-designed children’s bathroom are safety, ease-of-use, durability, and longevity of design. Let’s break the bathroom into sections and we’ll share our tips to make your kids’ bathroom functional for all ages. Opt for a shower with a tub. While tubs are not often used by teens and adults, it is usually a necessity for young children. Plan a tub that is amply sized for teens and adults down the road. Showering in an all-in-one fiberglass tub/shower is the most financially feasible option but can get a little claustrophobic for many. Surrounding a tub with tile or solid surface adds design, character, and a little more elbow room. Some brands offer a toilet seat with an integrated rim that is child-sized. When the child outgrows the necessity for this function, simply replace the seat. Also, the toilet height is usually an important decision. While a standard height toilet provides ease-of-use for a young child, an adult height or “comfort” height is likely best for everyone else. Of course, a toilet can be replaced easily as the child grows or when the kids’ bath will be converted into a guest bath. Instead of privacy hardware on the entry door, use passage hardware that can’t be locked from inside for younger children. This can be easily changed as the child grows. The vanity height is often a concern when designing a kids’ bath. The old vanity height of 30” is no longer used except for special circumstances. Often a client will choose a height of 32”-34” so that it helps the child reach the sink and still is useful for teens and adults. Sometimes the adult height of 34½” is chosen for longevity reasons. 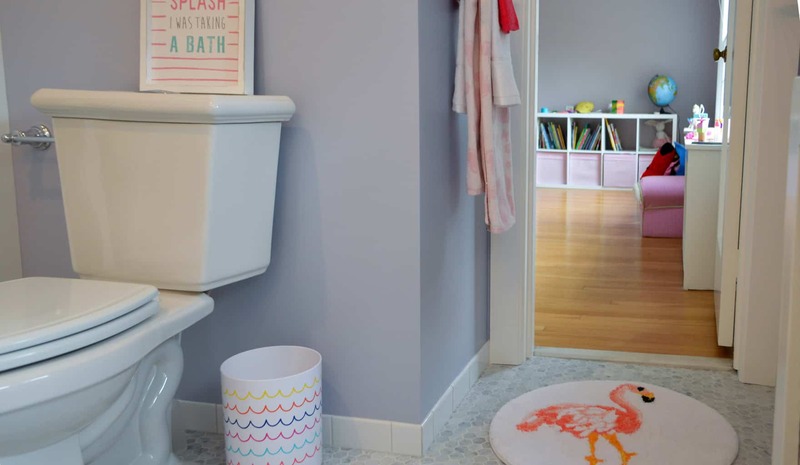 The thinking here is that the child will have to use a stool for a season either way, so make the height of the vanity efficient for when they are through the stool phase and for when the kids are out of the house and the bathroom is converted to a guest bath. To keep damage at a minimum, consider using tile flooring and tile baseboard instead of wood. Add plenty of floor mats to help avoid slipping. A suitable ventilation fan is a must to remove humidity from the bathroom. Humidity causes mold/mildew issues which can warp wood-made products and can damage many other products and surfaces. How much should you expect to spend on a kids’ bath remodel? A coat of paint and some new hardware can easily make the space appealing and will cost very little. A full remodel will cost much more. Often, the desired scope of work is not in sync with the desired budget of a kids’ bath. Since there are many factors to consider, the best thing to do is to meet with a design professional to help develop a budget. Remember, a bathroom may be small, but there is no other room that is packed with as much product and labor per square foot of space. So meet with a professional to see if your thoughts for your budget will allow you to accomplish your project. Designing a bath your kids won’t outgrow is possible! If you take these tips for longevity with you when you meet with your professional bath designer, you will be better prepared to fill your bathroom with products that will last. And remember, you will always be able to change the shower curtain, rugs, towels and accessories to accommodate their evolving style. How Do I Know if a Cabinet Is Good Quality? I’ve watched hundreds of homeowners (and their kids!) walk into our cabinet showroom and 99% of them open and close cabinet doors and drawers. Open, close, open, close – this helps you “feel” the quality. New cabinets will be the foundation of your design whether you are building or remodeling a kitchen or bath in your home. If you are asking the question how do I know if a cabinet is good quality, we are happy to provide the basic elements of beautiful, quality cabinetry. But when it comes to cabinet construction itself, what are you looking for? Not all cabinets are created equal. How do you know if a cabinet is good quality? 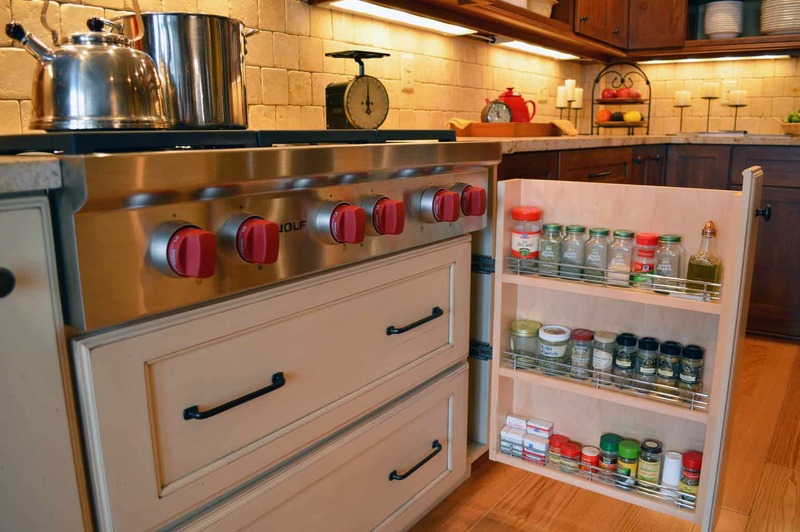 Here are 5 elements that should be on your radar when shopping for quality cabinetry for your kitchen or bath. 1. How are the cabinets constructed? This is usually the boring part of the research process. But it’s actually just as important to know about construction, joints, and bracing of cabinets as it is what kind of materials the box is made from. Glue is often used as part of constructing cabinet boxes, so don’t be alarmed if you see a touch of dried glue on the inside corners. However, the process is more than just gluing two pieces of wood together. When a deep groove meets a matching joint—this joint is strong and the glue has more surface to adhere to for extra strength. (This is what we call a “dado joint.”) The “bracing” of the cabinet box is also extremely important for strength and durability. Wood or engineered I-Beams let into the sides, front, and back are preferred for base cabinet construction. Thick cabinet backs let-into the cabinet sides is preferred for wall cabinets. Whether framed or frameless construction, joints, bracing and material thickness keep a cabinet from falling apart and help keep it square. 2. What is the difference between traditional wood cabinet boxes and frameless cabinet boxes? A traditional wood cabinet box has a face frame (usually 1 ½ inches wide) where the door closes onto the cabinet. If you’re considering a traditional, framed cabinet, and have already confirmed solid construction, good joinery, sturdy bracing, and an all-wood frame, then you’d be making a classic choice. However, if you’re impressed with more accessibility and more useable space inside the cabinet, then frameless (also called “European-style” or “full-access” cabinets) might be the way to go. Frameless describes a process of building a cabinet without the front frame. It doesn’t mean your cabinets will look European because your cabinet door will actually be what determines the style. Cabinet manufacturers offer traditional, transitional or contemporary door styles in both framed and frameless cabinetry. However, the most contemporary kitchens or baths are using frameless cabinetry. 3. What’s the difference between plywood and particleboard? Throughout the industry, plywood is considered the better choice. Plywood is usually stronger than particleboard and doesn’t expand as easily in moist environments. Is particleboard always bad? Not always. If your cabinet layout includes cabinet boxes next to each other, and they are constructed properly, then the particleboard sides are “buried” and unseen. However, on end cabinets with sides exposed, have your designer specify a “finished end” with a plywood side, or at least an engineered side which has a veneer of real wood. The worst aspect of a particle board cabinet is to have a paper or “picture” of wood on an exposed end rather than real wood. One final thought: if we’re talking about drawers, thin particleboard drawers with staples for joints would not have the lifespan of their wood counterparts. 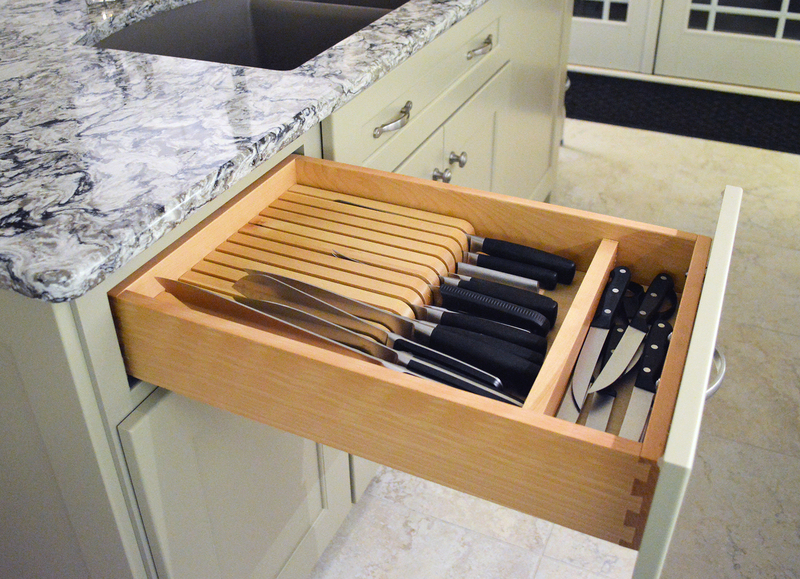 Some cabinet lines may try to cut corners and use particleboard for drawer boxes. Beware! 4. What about the drawers? In a traditionally framed cabinet, all-wood drawer boxes are the best. The joinery should be dovetailed with the drawer bottom made of a sufficiently dimensioned plywood. The drawer hardware (glides and soft-close hardware) is critical to the sturdiness. Remember, slamming drawers often happens in the bustle of a kitchen. 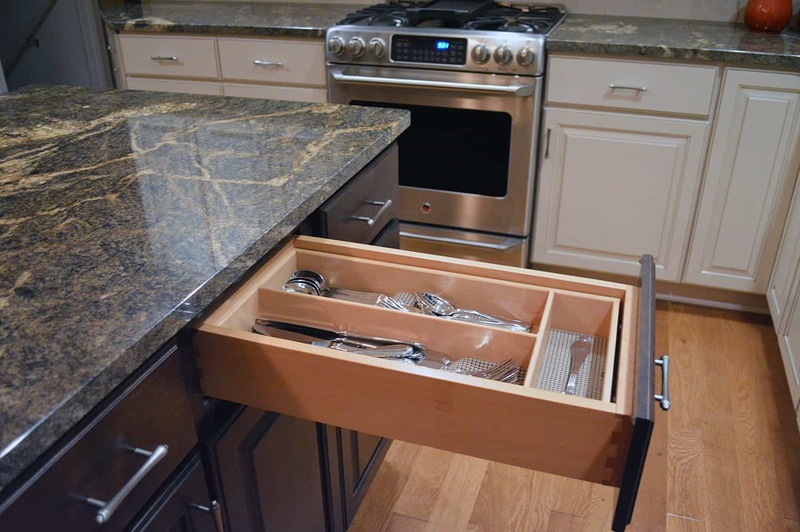 But with the mechanical advancement of slides and soft-close hardware, you can make slamming drawers a thing of the past! For frameless cabinets, soft-close is a must as well, but the drawer boxes can be wood or metal. And always purchase full-extension glides so that you don’t lose useful space! 5. Is the cabinet warranty essential? Yes! Here is a typical cabinet warranty example from Custom Cupboards lifetime warranty. While manufacturer warranties are important, what is most important is the stability and longevity of the company with which you are doing business. Warranties are only valuable if the company is still in business when you need them. Even a good solid manufacturing company warranty is difficult to use if there are no dealers around to service the product. And dealers generally don’t like to service product purchased from a competing dealer. Purchasing any large ticket products should be from a local business that has been around a long time and has a good service reputation. Because not all cabinets are created equal, you have to do your research on how they are made in order to really assess their quality. To answer your question, how do I know if a cabinet is good quality… Look for dado joints, all-wood frame and drawers, dovetailed drawers, soft-close drawer hardware, and a lifetime warranty. Don’t be fooled, just because a door style is contemporary and the drawer mechanics are soft-close doesn’t mean the cabinetry is of a good quality. Follow the guidelines in the five questions above, and you will be on your way to finding quality cabinetry. Often when homeowners are browsing Houzz.com, they add dozens of kitchen photos into ideabooks without knowing which style of kitchen those photos represent. There’s nothing wrong with that. 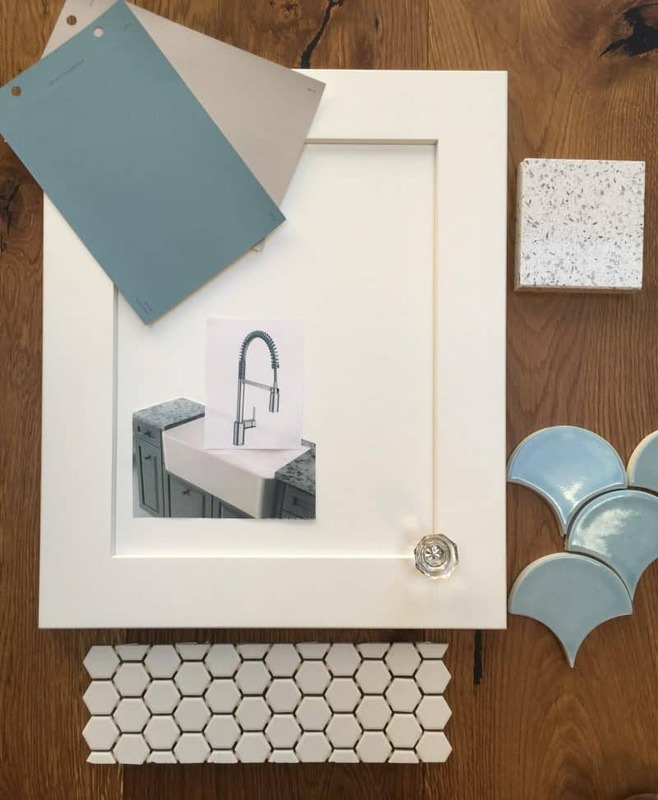 But when you’re a homeowner ready to start making decisions on your kitchen remodel, knowing what style and trends you like will help narrow your design options and direct your focus.